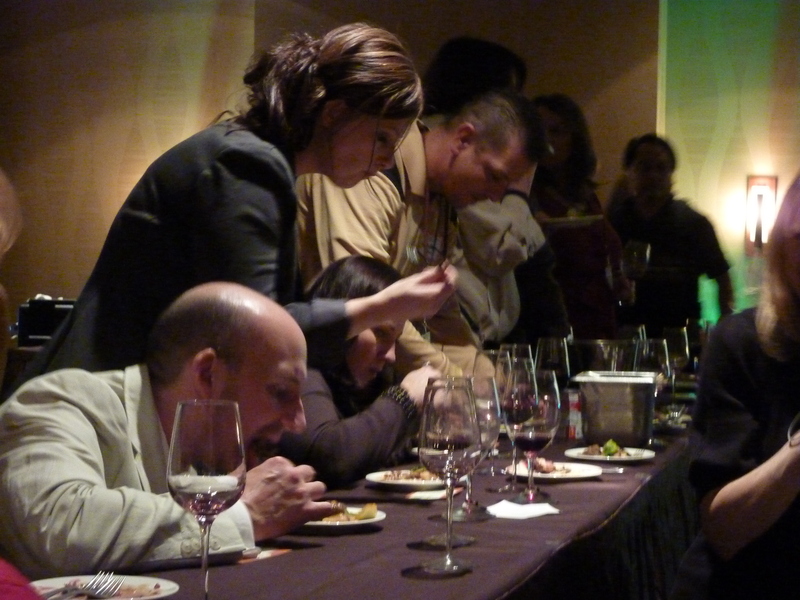 The second annual Taste of Tulalip (Grand Taste, Saturday, November 14th) was again a success. The Rock ‘n Roll Challenge, mc’d by Q13 Fox’s Lily Jang, was fun to watch as there was healthy competition while viewing the big screens with some of history’s favorite Rock…I happened upon Guns n’ Roses and Free. Wine Tasting was plenty. I can give a shout out to 1. Lachini Vineyards (Oregon) 2007 Pinot Noir 2. Isenhower Cellars (Walla Walla and Woodinville) El Conquistador 3. Five Star Cellars…Everything! 4. Walla Walla Vintners Sangiovese 5. Flying Trout Malbec blend 6. 2008 Turnbull Red (Napa Valley) 7. and my favorite new find..Lantz Cellars (Lake Stevens)…especially the Syrah and the now released cabernet sav. And if you like to Tweet, watch the posts in the Twitter Lounge. A good preamble for this event can be found at http://blog.seattlepi.com/eastsideinside/archives/227940.asp. Missed the Grand Taste Pass at TOT this year? Mark your calendar for 2011 – Saturday, November 12th! The food served at this event is varied, modern, and tasty. A variety included Crab Cobb Salad (my favorite..absolutely wonderful), Scallop sautéed in butter (so good…) and lamb, among others. The Resort showcases top of the line guest suites. The rooms are all suites and offer many comforts of a road trip worthy getaway. The staff was fabulous…from housekeeping to the service by William in the Shehal Room while we enjoyed the Seattle Seahawks game the following morning. Tulalip hosts a great array of restaurants. As this was a Saturday evening and the Resort and Casino were packed, we picked up some snacks to go and brought them in to the Canoes Cabaret for consumption while we danced in our seats to The Spazmatics..and then cut a rug at mpulse Lounge. On Sunday, while watching the Seahawks game, we enjoyed Prime Rib, Club Sandwich, and Burgers in the Shelal Room. Spend the weekend, stay the night, enjoy the experience of pure delight! Palomino – in Washington…located in Seattle and Bellevue. This visit was to Bellevue as it was recommended for its lunch specials. Combination specials are a hit here…allows for a mix/match of soup, salad, sandwich or pasta. The two choices are served in bowls on a rectangular platter. The presentation was key! I can recommend the chop chop salad, tomato basil soup, and Rigatoni Bolognese. Check out the menu http://www.palomino.com/page/menu/ The hostess was top notch and service was nice. The person removing dishware from the table could have waited a bit longer. UPDATE 3/10/11 – ooohhh…got the last of the Pappy Vanwinkle. So worth it! This visit…celebrating an anniversary found us ordering the crab legs, filet steak strips, steakhouse slider with fries, artichoke hearts, and an apple tart. T hanks for time to be together, turkey, talk, and tangy weather. S for sizzles, sights, and sounds, and something special that about. That spells THANKS for joy in living and a jolly good Thanksgiving. This November, there are 38 restaurants who participate in the 3 for $30 promotion. The 3-course meal includes an appetizer, entrée and dessert. Enjoy the delicious fare at some of the top restaurants Monday thru Thursday during the month of November. Some offer lunch specials as well for $15 per person. Check out http://www.dinearoundseattle.org/about.php and you will find the participating restaurants. Click on the restaurant and you will find the mouth-watering menu selections. Reservations recommended. Menus are not available on Thanksgiving. An added bonus for those who might like to write about food…open the Table Talk tab! You are encouraged to compose a review and then submit it for a possible chance of winning two $30 gift certificates to one of the participating restaurants. So much fun!